My Oracle: Oracle12c OCP Exam Went through..
Oracle12c OCP Exam Went through.. I am glad i went through Oracle12c OCP exam yesterday and passed! I went through Oracle training and read study material helped me to get through this exam. This exam has two section. Section 1 is New features of Oracle database 12c. Passing score is 64%. I scored 86%. Section 2 is Key DBA skills. Passing score is 65%. I scored 90%. Here are some sample OCP questions. There is enough free space in the disk gorup for mirroring to be done. What happens if the CONTROLLER1 failure group becomes unavailable due to maintenance error? until the CONTROLLER1 for failure group is brought back online. C) The data in the CONTROLLER1 failure group is copied to the CONTROLLER2 failure group and re balancing is initiated. D) ASM does not mirror any data until the controller failure group is brought back online, and newly allocated primary allocation unit (PA) are stored in the controller2 failure group without mirroring. In your Multitenant container database(CDB) containing pluggable database(CDB), users complain about performance degradation. How does real - time automatic database diagnostic monitor check performance degradation and provide solutions? a) It collects data from SGA and compares it with a preserved snapshot. b) It collects data from SGA, analyze it and provides a report. c) It collects data from SGA and compares it with a latest snapshot. d) It collects data from both SGA and PGA, analyze it and provides a report. Your Multitenant container database(CDB) has three pluggable database(PDB's) : PDB1,PDB2,PDB3. Which two RMAN commands may be, used to backup only the PDB1 pluggable database? a) BACKUP PLUGGABLE DATABASE PDB1 while connected to the root container. b) BACKUP PLUGGABLE DATABASE PDB1 while connected to the PDB1 container. c) BACKUP DATABASE while connected to the PDB1 container. d) BACKUP DATABASE while connected to the boot container. e) BACKUP PLUGGABLE database PDB1 while connected to PDB2. The answer A and C.
What is the result when you start up the database instance? The following parameter are set in your database instance. Which statement is true about the archived log redo files? d) They are created in the location specified by the DB_RECOVERY_FILE_DEST_1 parameter and location specified by DB_RECOVERY_FILE_DEST parameter. A user issues a query on a table on one of the PDBs and receives the following error. The answer A and E.
The persistent configuration settings for RMAN have defualt for all parameters. Which two are prerequisite for performing a flashback transaction? Which three statements are true about Automatic Workload Repository(AWR)? Which three statements are true about using flashback database in a multitenant container database(CBD)? b) To enable flashback database, the CDB must be mounted. Which two statements are true when row archival management is enabled? b)The ORA_ARCHIVE_STATE column is updated manually or by a program that could reference activity tracking columns, to indicate that a row is no longer considered active. e)The ORA_ARCHIVE_STATE column is updated automatically by the Oracle Server based on activity tracking columns, to indicate that a row is no longer considered active. Oracle Grid Infrastructure for a stand-alone server is installed on your production host before installing the Oracle Database server. The database and listener are configured by using oracle Restart. CRS-4622: Oracle High Availability Services auto start is enabled. a) When you start an instance on a high with SQL *Plus dependent listeners and ASM disk groups are automatically started. b) When a database instance is started by using the SRVCTL utility and listener startup fails, the instance is still started. c) When database is created by using SQL * PLUS, it is automatically added to the Oracle Restart configuration. d) When you create a database service by modifying the SERVICE_NAMES initialization parameter, it is automatically added to the Oracle Restart configuration. Which three statements are true regarding the use of the Database Migration Assistant for Unicode(DMU)? e)The DMU can report columns that are not represented in the converted characterset. Which task should you perform before issuing the command? a)Place the root container in ARHCHIVELOG mode. b)Take the user data tablespace offline. c) Place the root container in the nomount stage. d) Ensure that HR_PDB is open. Which three statements are true about Oracle Data Pump export and import operations? e) You can detach from a data pump import job and reattach later. a)It automatically performs verification or evolves non-accepted plans, in COMPREHENSIVE mode when they perform better than existing accepted plans. b)The optimizer always uses the fixed plan, if the fixed plan exists in the plan baseline. e)The non-accepted plans in a SQL plan baseline are automatically evolved, in COMPREHENSIVE mode, during the nightly maintenance window and a persistent verification report is generated. On your Oracle 12c database, you invoked SQL * Loader to load data into the EMPLOYEES table in the HR schema by issuing the following command. d)It fails because no SQL * Loader control file location is specified. You plan to Migrate your database from a file system to ASM on same platform. Which two methods or commands would you use to accomplish this task? Which two statements are true about the RMAN validate database command? What should you do before executing the commands to retore and recover the data in ACCOUNTS_PDB? ALTER PLUGGABLE DATABASE accounts_pdb CLOSE IMMEDIATE command. You use a recovery catalog for maintaining your database backups. e)backup sets containing both data files and archive logs are created. You generate the compare period Automatic Database Diagnostic Monitor(ADDM) report to further investigation. a)It detects any configuration change that caused a performance difference in both time period. b)It identifies any workload change that caused a performance difference in both time period. c)It detects the top wait events causing performance degradation. d)It shows the resource usage for CPU, memory, and I/O in both time periods. f)It gives information about statistics collection in both time periods. 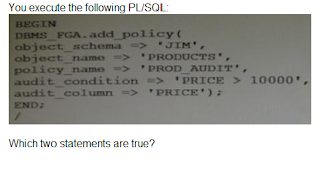 Which three statements are true about SQL plan directives? a)They are tied to specific statement or SQL ID. b)They instruct the maintenance job to collect missing statistics or perform dynamic sampling to generate a more optimal plan. c)They used to gather only missing statistics. d)They are created for a query expression where statistics are missing or the cardinality estimates by the optimizer are incorrect. 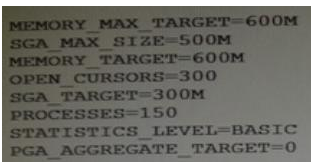 e)They instruct the optimizer to create only column group statistics. f)Improve plan accuracy by persisting both compilation and execution statistics in the SYSAUX tablespace. Which four actions are possible during an online Data file Move operations? a)Creating and dropping tables in the data file being moved. b)Performing file shrink of the data file being moved. c)Querying tables in the data file being moved. d)Performing Block Media Recovery for a data block in the data file being moved. f)Executing DML statements on objects stored in the data file being moved. a)Fine Grained Auditing(FGA) is enabled for the PRICE column in the PRODUCT tables for SELECT statements only when a row with PRICE > 10000 is accessed. b)FGA is enabled for the PRODUCTS.PRICE column and an audit record is written whenever a row with PRICE>10000 is accessed. c)FGA is enabled for all DML operations by JIM on the PRODUCTS.PRICE column. d)FGA is enabled for the PRICE column of the PRODUCTS table and the SQL statements are captured in the FGA audit trail. You are administering a database stored in ASM. You use RMAN to backup the database and the MD_BACKUP command to backup the ASM metadata regularly. You lost an ASM disk group DG1 due to hardware failure. In which three ways can you re-create the lost disk group and restore the data? a)Use the MD_RESTORE command to restore metadata for an existing disk group by passing the existing disk group name as an input parameter and use RMAN to restore the data. b)Use the MKDG command to restore the disk group with the same configuration as the backed -up disk group and data on the disk group. c)Use the MD_RESTORE command to restore the disk group with the changed disk group specification, failure group specification name, and other attributes and use RMAN to restore the data. d)Use the MKDG command to restore the disk group with the same configuration as the backed-up disk group name and same set of disks and failure group configuration, and use RMAN to restore the data. e)Use the MD_RESTORE command to restore both the metadata and data for the failed disk group. f)Use the MKDG command to add a new disk group DG1 with the same or different specifications for failure group and other attributes and use RMAN to restore the data. Examine the parameters for your database instance. Which three statements are true about the process of automatic optimization by using cardinality feedback? a)The optimizer automatically changes a plan during subsequent execution of a SQL statement if there is a huge difference in optimizer estimates and execution statistics. b)The optimizer can re optimize a query only once using cardinality feedback. c)The optimizer enables monitoring for cardinaltiy feedback after the first execution of a query. d)The optimizer does not monitor cardinality feedback if dynamic sampling and multicolumn statistics are enabled. e)After the optimizer identifies a query as a re-optimization candidate, statistics collected by the collectors are submitted to the optimizer. Which two are possible if table updates are performed which affect the invisible index columns? c)The index automatically becomes visible in order to have it updated by DML on the table. e)The index is updated by the DML on the table. Which three are direct benefits of the multiprocess, multithreaded architecture of Oracle Database 12c when it is enabled? You are using SQL Plus to the root container of a multitenant container database(CDB) with SYSDBA privilege. The CDB has several pluggable databases(PDB's) open in the read/write mode. What happens after issuing the SHUTDOWN TRANSACTIONAL statement? a) The shutdown proceeds immediately. The shutdown proceeds as soon as all transactions in the PDB's are either committed or rolled back. b)The shutdown proceeds as soon as all transactionals in the CDB are either committed or rolledback. c)The shutdown proceeds as soon as all transactions in both the CDB and PDBs are either committed or rolled back. Which two statements are true about the use of the procedures listed in the v$sysaux_occupants.move_procedure column? a)The procedure may be used for some components to relocate component data to the SYSAUX tablespace from its current tablespace. b)The procedure may be used for some components to relocate component data from the SYSAUX tablespace to another tablespace. d)All the components may be mvoed from the SYSAUX tablespace. User SCOTT has been granted the CREATE SESSION privilege and the MGR role. Which two statements are true when a session logged in as SCOTT queries the SAL column in the view and the table? a) Data is redacted for the EMP.SAL column only if the SCOTT session does not have the MGR role set. b)Data is redacted for EMP.SAL column only if the SCOTT session has the MGR role set. 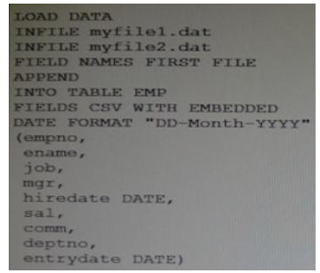 d)Data is redacted for the EMP_V.SAL column only if the SCOTT session has the MGR role set. e)Data is redacted for the EMP_V.SAL column only if the SCOTT session does not have the MGR role set. Examine the parameter for your database instance. b)The optimizer chose different plans because automatic dynamic sampling was enabled. d)The optimizer chose different plan because extended statistics were created for the column used. You are the DBA supporting an Oracle 11g Release 2 database and wish to move a table containing several DATE, CHAR, VARCHAR2 and NUMBER data types, and the table's indexes, to another tablespace. Which technique will move the table and indexes while maintaining the highest level of availability to the application? Which two partitioned table maintenance operations support asynchronous Global index Maintenance in Oracle database 12c? Examine the details of the Top 5 Timed Events in the following AWR report? e)The buffers are being read into the buffer cache. but some other session is changing the buffers. Which statement is true about EM express in oracle 12c? e)You can create and configure pluggable databases by using EM express. c)A new log xml file that contains the DDL statements is created, and the DDL command details are removed from the alert log file. d)Only DDL commands that resulted in the creation of new database files are logged. What is the result of executing a TRUNCATE TABLE command on a table that has Flashback Archiving enabled? d)The rows in both the table and the archive are truncated. frequently with queries that span multiple partitions. The table has a local prefixed, range partitioned index. Some of these queries access very few rows in some partitions and all the rows in other partitions, but these queries still perform a full scan for all accessed partitions. This commonly occurs when the range of dates begins at the end of a month or ends close to the start of month. You want an execution plan to be generated that uses indexes access when only a few rows are accessed form a segment, while still allowing full scans for segments where many rows are returned. Which three methods could transparently help to achieve this result? a)Using a partial local index on the warehouse fact table month column with indexing disabled to the table partition that return most of their rows to the queries. b)Using the partial local index on the warehouse fact table month column with indexing disabled for the table partition that return a few rows to the queries. c)Using a partitioned view that does a UNION ALL query on the partitions of the warehouse fact table, which retains the existing local partitioned column. d)Converting the partitioned table to a partitioned view that does a UNION ALL query on the monthly tables, which retains the existing local partitioned column. e)Using the partial global index on the warehouse fact table month column with indexing disabling for the table partitions that return most of their rows to the queries. f)Using a partial global index on the warehouse fact table month column with indexing for disabled for the table partition that return a few rows to the queries. Examine the query and its output. Which two tasks must you perform to add users with SYSBAKCUP,SYSDG and SYSKM privilege to the password file? a)Assign appropriate OS groups to SYSBAKCUP,SYSDG and SYSKM. b)Grant SYSBAKCUP,SYSDG and SYSKM privilege to the intended users. c)Re-create the password file with SYSBAKCUP,SYSDG and SYSKM privilege and the FORCE argument set to No. d)Re-create the password file with SYSBAKCUP,SYSDG and SYSKM privilege, and FORCE arguments set to Yes. You Create a table with the PERIOD FOR clause to enable the use of the Temporal Validity features of Oracle Database 12c. Which three statements are true concerning the use of the Valid Time Temporal features for the EMPLOYEES table? a) The Valid time columns employee_time_start and employee_time_end are automatically created. b) The same statement may filter on both transaction time and valid temporal time by using the AS OF TIMESTAMP and PERIOD FOR clause. d)The valid time columns are visible by default when the table is described. e)Setting the session valid time using DBMS_FLASHBACK_ARCHIVE_ENABLE_AT_VALID_TIME sets the visibility for DML , DDL and queries performed by the session. Which two statements are true concerning the Resource Manager plans for individual pluggable databases(PDB plans) in a multitenant container database(CDB)? c)If a PDB plan is enabeld for a pluggable database, then resources are allocated to consumer groups across all PDBs in the CDB. d)If no PDB plan is enabled for a pluggable database, then the PDB share in the CDB plan is dynamically calculated. e)If a PDB plan is enabled for a pluggable database, then resources are allocated to consumer groups based on the shares provided to the PDB in the CDB plan and the shares provided to the consumer groups in the PDB plan. Your Database supports a DSS workload that involves the execution of complex queries. Currently, the library cache contains the ideal workload for analysis. You want to analyze some of the queries for an application that are cached in the library cache. a)Create a SQL Tuning Set (STS) that contains the queries cached in the library cache and run the SQL Tuning Advisor(STA) on the workload captured in the STS. c)Create an STS that contains the queries cached in the library cache and run the SQL performance analyzer (SPA) on the workload captured in the STS. Which three statements are true regarding the SQL * Loader operation performed using the control file? a)An EMP table is created if a table does not exist. Otherwise, if the EMP table is appended with the loaded data. b)The SQL * Loader data file myfile1.data has the column names for the EMP table. f) You can connect as a local user by using the SET CONTAINER statement. Which three tasks can be automatically performed by the automatic Data optimization feature of information life cycle management (ILM)? d) Tracking the most recent write time for table block. Which three are true about the large pool for an oracle database instance that supports shared server connections? You want to flash back a test database by five hours. Which two statements are true about this flashback scenario? a) The database must have multiplexed redo logs for the flashback to succeed. d) The database must be opened in restricted mode for the flashback to succeed. Examine the query and its output executed in an RDBMS instance. Which three statements are true about the users(other than sys) in the output? A)The C ## B_ADMIN user can perform all backup and recovery operations using RMAN only. You are connected to a pluggable database(PDB) as a common user with DBA privileges. a)The STATISTICS_LEVEL parameter is set to ALL whenever this PDB is re-opened. b)The STATISTICS_LEVEL parameter is set to ALL whenever any PDB is reopened. c)The STATISTICS_LEVEL parameter is set to ALL whenever the multitenant container database(CDB) is restarted. d)Nothing happens, because there is no SPFILE for each PDB, the statement is ignored. You upgraded from a previous Oracle database version to Oracle Database 12c. Your database supports a mixed workload. During the day, lots of insert, update, delete operations are performed. At night, Extract, Transform, Load(ETL) and batch reporting jobs are run. The ETL jobs perform certain database operations using two or more concurrent sessions. After the upgrade, you notice that the performance of ETL jobs has degraded. To ascertain the cause of performance degradation, you want to collect basic statistics such as the level of parallelism, total database time, and the number of I/O requests for the ETL jobs. d)Enable real-time database operation monitoring using the DBMS_SQL_MONITOR.BEGIN_OPERATION function, and then use the DBMS_SQL_MONITOR.REPORT_SQL_MONITOR function to view the required information. Your database is open and the LISTENER listener running. You stopped the wrong listener LISTENER by issuing the following command. What happens to the session that are presently connected to the database instance? Which three statements are true about using an invisible column in the PRODCTS table? a)The %ROWTYPE attribute declarations in PL/SQL to access a row will not display the invisible column in the output. b)The DESCRIBE commands in SQL * Plus will not display the invisible column in the output. e)A primary key constraint can be added on the invisible column. A senior DBA asked you to execute the following command to improve the performance. You checked the data in the SUBSRIBE_LOG table and found that it is a large table containing one million rows. a)The keep pool is not configured. Your multitenant container (CDB) containing three pluggable databases (PDBs) is running in ARCHIVELOG mode. You find that the SYSAUX tablespace is corrupted in the root container. The steps to recover the tablespace are as follows. c)The file ‘+data.231.54769’ remains in the same location and a synonym ‘myfile.dbf’ is created. e)The file ‘+data.231.54769’ is created in ‘+data/prod’ and the reference to ‘+data.231.54769’ in the data dictionary removed. Identify there scenarios in which you would recommend the use of SQL performance Analyzer to analyze impact on the performance of SQL statements. You created an encrypted tablespace. You then closed the encryption wallet because you were advised that this is secure. Later in the day, you attempt to create the EMPLOYEES table in the SECURESPACE tablespace with the SALT option on the EMPLOYEE column. Which is true about the result? a)It creates the table successfully but does not encrypt any inserted data in the EMPNAME column because the wallet must be opened to encrypt columns with SALT. c) It creates the table successfully, and encrypts any inserted data in the EMPNAME column because the wallet needs to be open only for tablespace creation. e)It generates error when creating the table, because the salt option cannot be used with encrypted tablespaces. What are three purpose of the RMAN "FROM" clause? e)To support file recovery over the network in a Data Guard environment. You performed an incremental level 0 backup of a database. d)More than one database block may be read by an incremental backup for a change made to single block. e)The incremental level 1 backup that immediately follows the enabling of block change tracking will not read the change tracking file to discover changed blocks. c)It fails and reports and error because the CONTAINER=ALL clause is not specified in the command. d) It fails and reports and error because the CONTAINER=CURRENT clause is not specified in the command. e) It executes successfully but neither tablespace not the data file is created. In your multitenant container database(CDB) containing pluggable database(PDBs), you granted the CREATE TABLE privilege to the common user C##A_ADMIN in root and all PDBs. You execute the following command from the root container. a)It executes successfully and the CREATE TABLE privilege is revoked from C##A_ADMIN in root only. b)It fails and reports an error because the CONTAINER=ALL clause is not used. c)It excludes successfully and the CREATE TABLE privilege is revoked from C##A_ADMIN in root and all PDBs. d)It fails and reports an error because the CONTAINER=CURRENT clause is not used. e)It executes successfully and the CREATE TABLE privilege is revoked from C##A_ADMIN in all PDBs. Which three statements are true about Flashback Database? a)Flashback logs are written sequentially, and are archived. b) Flashback Database uses a restored control file to recover the database. c)The oracle database automatically creates, deletes, and resides flashback logs in the fast recovery area. d) Flashback database can recover a database to the state that it was in before a reset logs operation. e) Flashback Database can recover a data file that was dropped during the span of time of the flashback. In your database, you want to ensure that idle sessions that are blocking active are automatically terminated after a specified period of time. d)Decreasing the value of the IDLE_TIME resource limit in the default profile. Which three initialization parameters are not controlled by ASMM? Your multitenant container database(CDB) is running in ARCHIVELOG mode. You connect to the CBD RMAN. Examine the following command and its output. You execute the following command. You executed a DROP USER CASCADE on an Oracle11g release 1 database and immediately realized that you forgot to copy the OCA.EXAM_RESULT table to the OCP schema. a)Execute FLASHBACK TABLE OCA.EXAM_RESULTS TO BEFORE DROP RENAME TO OC.EXAM_RESULTS; connect as SYSTEM. b)Recover the table using traditional Tablespace point in time recovery. they do not have any privileges? You notice a performance change in your production Oracle12c database. You want to know which change caused this performance difference. The tnsnames.ora file has an entry for the service alias ORCL as follows. The TNS ping command executes successfully when tested with ORCL; however, from the same OS user session, you are not able to connect to the database instance with the following command. c)The orcl.oracle.com database service is not registered with the listener. You administer an OLTP system whose database is stored in ASM and whose disk group use normal redundancy. One of the ASM disk goes offline, and is then dropped because it was not brought online before DISK_REPAIR_TIME elapsed. f)Increase the number of DBWR_IO_SLAVES in the ASM instance. You are required to migrate your 11.2.0.3 databases as a pluggable database(PDB) to a multitenant container database(CBD). Perform a full transportable export on the source database with the VERSION parameter set to 12 using the expdp utility. Copy the associated data files and export the dump file to the desired location in the target database. Identify the correct order of the required steps. a)One audit record is created for every successful execution of a SELECT, INSERT OR DELETE command on a table, and contains the SQL text for the SQL statement. b) One audit record is created for every successful execution of a SELECT, INSERT OR DELETE command, and contains the execution plan for the SQL statements. c) One audit record is created for the whole session if john successfully executes a SELECT, INSERT or DELETE command, and contains the execution plan for the SQL statements. d) One audit record is created for the whole session if JOHN successfully executes a select command, and contains the SQL text and bind variables used. e)One audit record is created for the whole session if john successfully executes a SELECT, INSERT or DELETE commands on a table, and contains the execution plan, SQL text, and bind variable used. Which three operations can be performed as multi partition operations in Oracle? In your multitenant container database(CDB) containing same pluggable databases(PDBs), you execute the following commands in the Root container. a)The C##ROLE1 role is created in the root database and all the PDBs. b)The C##ROLE1 role is created only in the root database because the container clause is not used. Which two statements are true about the Oracle Direct Network file system(DNFS)? e)Direct NFS can load-balance I/O traffic across multiple network adapters. Which method a used by the optimizer to limit the rows being returned? What is the result of the last SET CONTAINER statement and why is to so? You support Oracle Database 12c Oracle Database 11g, and Oracle database log on the same server. All database of all versions use ASM. Which three statements are true about the ASM disk group compatibility attributes that are set for disk group? In a recent AWR report for your database, you notice high number of buffer busy waits. The database consists of locally managed tablespace with free list managed segments. What option would you consider first to decrease the wait event immediately? In order to exploit some new storage tiers that have been provisioned by a storage administrator, the partitions of large heap table must be moved to other tablespaces in your Oracle12c database? A high volume of transactions access the table during the day and a medium volume of transactions access at night and during weekends. Minimal distruption availability is required. To implement Automatic Memory Management (AMM), you set the following parameters. ORA-00824: cannot set SGA_TARGET or MEMROY_TARGET due to existing internal settings, see alert log for more information. a)The import operation must be performed by a user on the target database with the DATAPUMP_IMP_FULL_DATABASE role, and the database link must connect to a user on the source database with the DATAPUMP_EXP_FULL_DATABASE role. You install a non-RAC oracle database, during installation, the oracle universal installer(OUI) prompts you to enter the path of the inventory directory and also to specify an operating system group name. d)The operating system group that is specified must have permission to write to the inventory directory. Identify two situations in which the alert log file is updated? a)Running a query on a table returns ORA-600: Internal Error. Which statement is true concerning dropping a pluggable database(PDB)? Your multitenant container database(CDB) contains three pluggable database(PDB). You find that the control file is damaged. You plan to use RMAN to recover the control file. There are no startup triggers associated with the PDBs. f)Start the database instance in the nomount stage and restore the control file from control file auto backup. In which two scenarios do you use SQL* Loader to load data? You use the segment advisor to help determine objects for which space may be reclaimed. Which three statements are true about the advisor given by the segment advisor? For which database users and for which executions is the audit policy now active? Select Two. e)It will create a CDB with root opened and seed mounted. You execute the following command to create password file in the database server. Which two statements are true about the password file? a)It records the usernames and passwords of users when granted the DBA role. Which three statements are true when the listener handles connection request to an Oracle 12c database instance with multithreaded architecture enabled in UNIX? Please explain choise on Question 72. Why not A? We could choose option A AND B if they ask two answers... I feel B is appropriate if they ask us to choose one answer. Thanks for providing very useful info. I am going to write OCP 12c upgrade this month. Are these questions sufficient enough to pass the exam?